Cytocell, (OGT Company) was established in 1991 at Birmingham Heartlands Hospital before moving to Banbury, Oxfordshire in 1994. 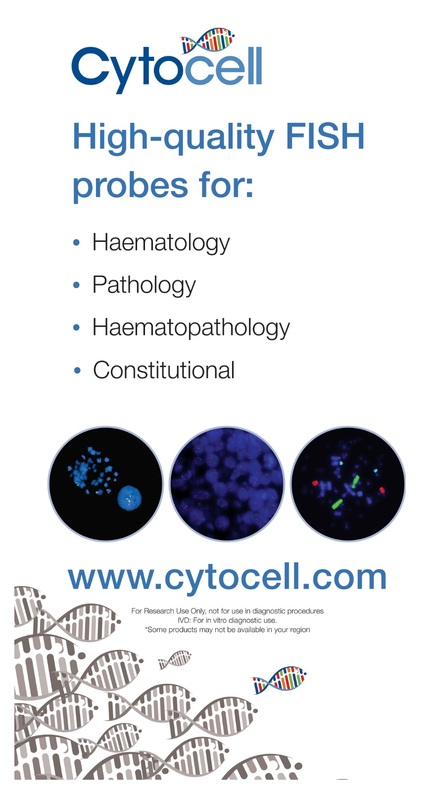 Since 2003, Cytocell has been located in Cambridge where we design and manufacture an ever increasing range of Fluorescence in situ Hybridisation (FISH) probes. Cytocell is a significant European manufacturer of FISH probes and has a well established Worldwide distribution network for its products, covering more than 60 countries. Our Chromoprobe Multiprobe® Macroarray system, where multiple probes are reversibly bound to a glass slide to provide a key diagnostic tool for the screening of genetic abnormalities (in leukaemia cases for example), is unique to Cytocell and subject to a worldwide patent and several registered designs. We also manufacture Multiprobe T and Octochrome devices which allow simultaneous analysis of subtelomeric abnormalities and whole chromosome painting respectively. Our ever-popular and well regarded Aquarius® range accounts for around two-thirds of our business, and provides a broad range of directly labelled single and combination liquid probes. Disclaimer: This website could contain product details or information not valid in your country or region. Please be aware that we do not take any responsibility for accessing such information, which may not comply with any legal process, regulation, registration or usage in the country of your origin. If you are a resident of a country other than those to which this site is directed, contact your local Cytocell distributor to obtain the appropriate product information for your country of residence.